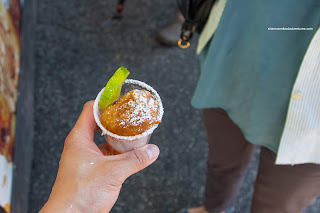 If you haven't noticed, there was no post about PNE eats last year (2015). Yep, for the first time in many years, I wasn't able to visit The Fair during its annual 15-day run since I was in Hawaii having a good time! 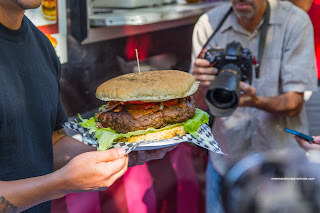 This year, I made it back from my Summer trip to attend the PNE food tour for local media. 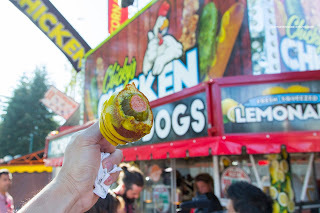 We started off strong with the Deep Fried Pickle Corn Dog at Chicky's Chicken. I liked this concoction as the juicy pickle added an impactful tart and saltiness to what was essentially a corn dog. Loved the crispy corn meal batter as it was crunchy and appealingly sweet. Now the food at the PNE is generally on the heavier side and traditionally sinful. They make no apologies for it and really that is the draw! 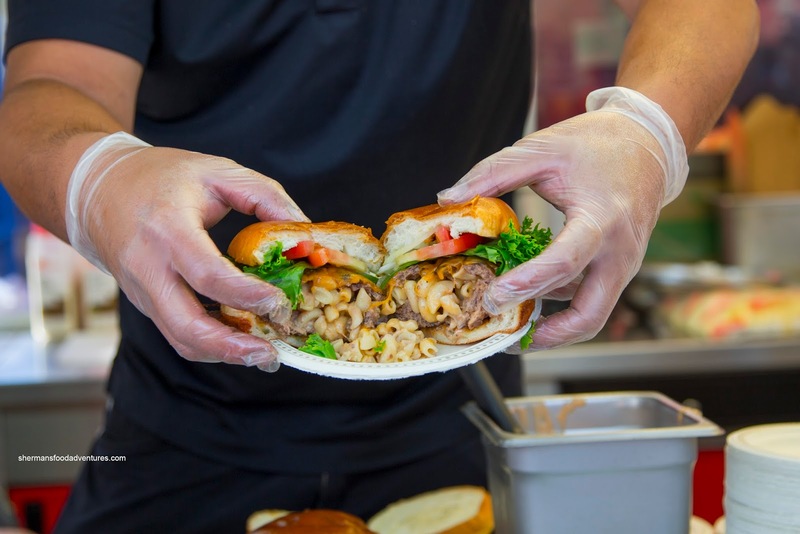 That was exemplified by the Mac & Cheese Stuffed Burger at Handmade Burgers. I found the meat to be decently moist while the mac n' cheese maintained its consistency (ie. not dried out and not contaminated by the cooking of the meat). Hence it was cheesy and creamy. The brioche bun was nicely toasted and soft. I did have to use a bit of ketchup to liven up the mild flavours though. Walking up a few spots up, we visited Reel Mac and Cheese. 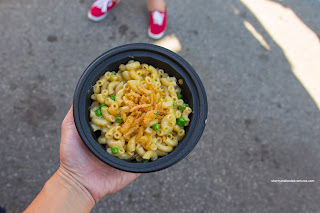 I've had their stuff before and I was pretty confident that the Slumdog Millionaire Mac & Cheese would deliver. The picture was only a sample size, as the regular portion would be even bigger (if that is believable). I found the noodles to be fairly al dente and dressed in a creamy (with just enough of it) sauce that had a proper amount of curry. It was aromatic and savoury benefiting from the pop of the sweet peas and the crunch from the fried onions. Moving directly across, we ended up at International Perogy's. Okay, I know what you are thinking... Hunky Bill's... We'll get to that later, but this one here was Chicken Teriyaki Perogies. Say what? Yah, this was a fusion of mini-perogies topped with fried chicken strips, sautéed onions, sriracha mayonnaise, sweet ginger teriyaki sauce, green onions and nori. 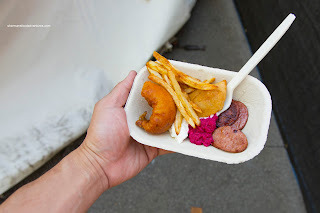 I thought the mini-perogies were easy to eat featuring a soft and thin skin. 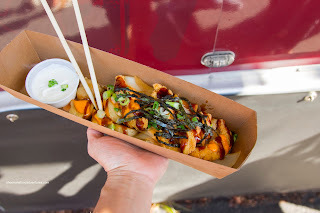 The flavours were definitely Asian with some spicy creaminess as well as the sweet gingery saltiness of the teriyaki sauce. Okay, it was bound to happen... The combination of my son's 2 most favourite desserts - Oreo cookies and a churro. 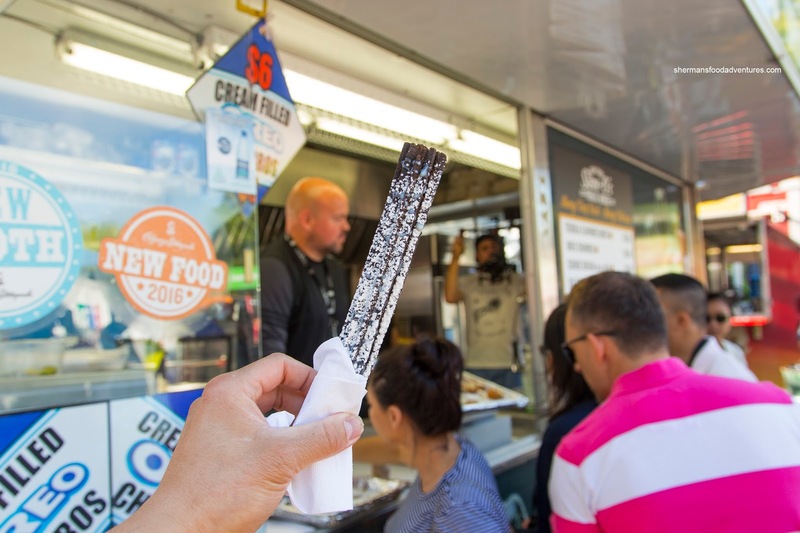 Yes, the Oreo Churro at Steve-O's, complete with its classic creme filling. I liked this as the churro itself was firmly crunchy (like the cookie) and tasted like an Oreo. It was amazingly not as sweet as I would've imagined. They offered up a second item as well with the Deep Fried Tequila. This was essentially a donut ball of sorts crossed with a fritter. Hence, it was lightly crispy while giving way to a soft cake interior. I found it pretty sweet, which was probably done intentionally to balance out the tequila. Personally, I would've loved to have more tequila and less sugar. If we were going to do deep-fried tequila donut/fritters, then why not keep on the same theme with Deep Fried Coffee at Ogopogo Concessions? I got to try the espresso and it was unmistakable in flavour while the texture was akin to a freshly made donut hole that was airy and light. I found it balanced in flavour so that the sweetness kept the coffee in check. In addition, there were several options for toppings including mocha chip, salted caramel, espresso flake, French vanilla and cream & sugar. Right next door at Gourmet Burgers, they have been serving up interesting and unique items for many years. This year, they decided to go big, literally. How about a 10lb monstrosity named the Hercules Burger? This thing must be ordered an hour ahead of time since it takes that long to cook. Sure, it costs $70.00, but it is enough for 15 people! I got a small piece to try and I was surprised that the well-seared patty was fairly moist and lean. This was actually a solid burger, however, the bun could've been toasted though. Remember when I mentioned Hunky Bill's? He's been around for 50 years serving up his homemade Ukrainian-style Perogies at the PNE. Unlike the fusion style ones we had earlier, these were classic being fried with onion and served with sour cream. Nothing fancy here, but solid crispy perogies sporting a tasty cheese and potato filling. Our food tour ended at the Craft Beer Festival on the West side of the PNE grounds. 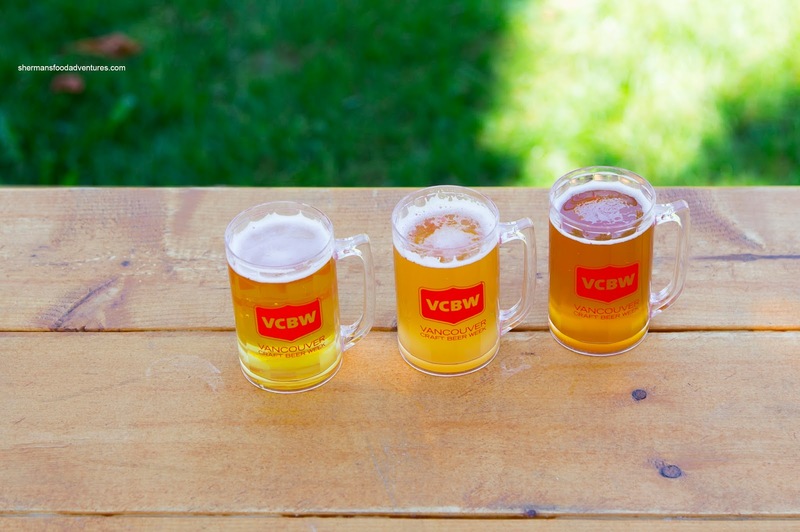 We sampled brews from Dead Frog, Parallel 49, Phillips Brewing and Moody Ales. Loved the little plastic mugs and of course the beer as well. This was served with a side of Bacon Floss (not pictured), think bacon flavoured cotton candy... So there you have it, some new and some old favourites at the PNE. I may be dropping by again next week, so stay tuned for more eats at the fair. Thanks for the review. I'm still contemplating whether I'll attend or not this year, seeing as I was rained on last year and I don't enjoy eating wet fries. We'll see what the weather gods dictate. . . I made it to the PNE. The weather was pretty fair with the odd shower. 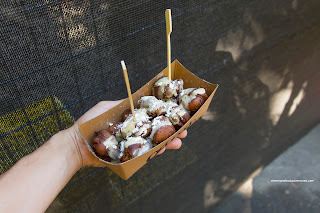 I tried the deep fried pickle corn dog which I enjoyed but I couldn't really taste the coffee in the deep fried donut. Oh well, 50/50 isn't bad. I wasn't feeling the bbq vibes so I had a plain old french fries and gravy from La Poutineria instead, which ended up being my favourite meal. The fries were crispy and there was plenty of gravy. I didn't need to eat the whole thing, but I did because it was just that good. I was so full I didn't have room for dinner. But truthfully, I really missed the scones which haven't been around for a couple of years.